Patvin is a leading supplier of Turnkey systems for spray finishing, paint circulation, sealant, adhesives and lubricant dispensing. Whether small volume or large robotic systems, we are the first choice! 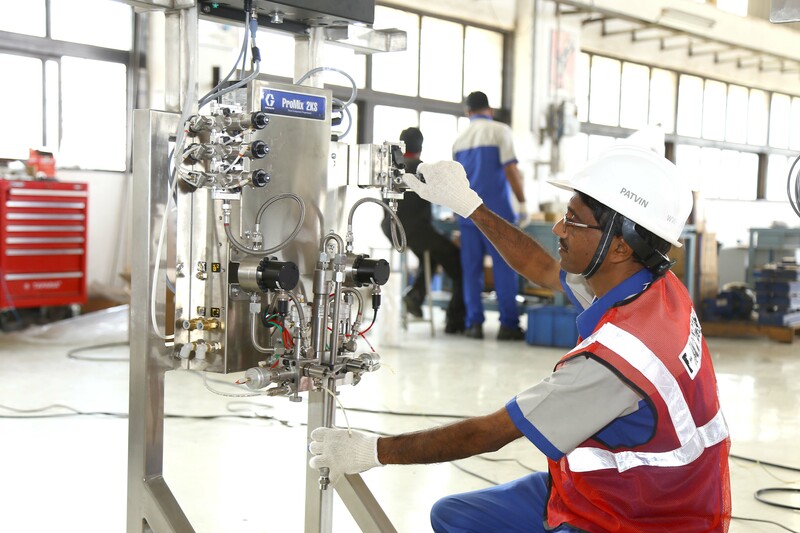 From design & engineering to system integration, installation, training and service, Patvin offers complete solutions to customers from diverse industry segments. Our team includes expert engineering professionals, designers, programmers, service engineers, and technicians with broad experience in the field. Founded in 1987, under the entrepreneurial vision of the Late Mr. Ivan D’costa, Patvin’s story has since then been a story of success, growth and dynamism. A highly committed, resourceful & target oriented organisation, Patvin has grown to be a trusted name in the industry. With a deep focus on innovation and investing 3% of our revenues into research and development, we develop advanced solutions of outstanding quality and efficiency. We strive to bring out the value others fail to discover. We Ideate, Innovate and Accomplish! We are Patvin. Your Partner for Quality. Impressive Inventory of parts & spares. We, the Management and employees of Patvin Engineering Private Limited, are committed to consistently deliver enhanced value to our customers in the systems that we deliver. We would achieve this through continual improvement of our processes and systems by way of Innovation, Technology, Knowledge Management and Employee Training. Providing High Quality Innovative Solutions to our Clients along with continual Growth Opportunities to our Partners and team Members. We are Committed to Excellence without compromising our Core Objectives of Diligence and Integrity. To Make Complex Operations/ Solutions Simple, Robust and Effective without compromising Our High Quality. Patvin signs Distributorship agreement with for M/s. GRACO Inc., USA. Supplied first turn key project to General Motors during their factory installation in India. Delivered large project to Mahindra Ford JV. Delivered first Hydraulically powered PCS systems, to Hyundai Motors Chennai, India. Patvin signs an agreement to work with ITW Automotive (now Carlisle) for the Paint application business. Inaugurated new Plant at Navi Mumbai. Inaugurated Paint & Sealant Application Laboratory. Inaugurated service centre facility at Pune. Delivered first electrically powered PCS systems to Mahindra, Nagpur. Inaugurated Plant 2 for Manufacturing. Completed glorious 25 years of successful Business. Inaugurated new Paint & Sealant Lab.